The Sims 4 had a controversial launch last fall for one main reason: unlike its immediate predecessor, the game didn’t feature toddlers. Not much has changed in the months since. And for many longtime fans, that’s the entire problem with The Sims 4. And why they’re walking away from their beloved game series. EA’s announcement prior to The Sims 4’s release that the game wouldn’t have toddlers (or swimming pools) was met with blowback. It was so swift and vociferous that it was hard not to notice. I first became aware of the more longstanding protest from diehard Sims fans when I started to hear from them directly. The first player to contact me was a woman named Elaine, who started a discussion on the official Sims forums last November calling out EA for its “silence on family play and family play fans.” Family play fans aren’t interested in a Sims with wacky mods or messing with the game by, say, killing Sims. They prefer to treat the game as a simulation of real-world families. The absence of toddlers is particularly glaring for these types of players because it omits a step in the standard Sim life-cycle—one that used to exist in The Sims 3 and was deemed essential by many. Elaine started her thread shortly after The Sims 4’s developers had said that they were adding swimming pools into the game for free, so she told me that part of her hope in chiming in on the forums was that they might do the same with toddlers. Or at least give players concrete details about when and how they’d appear in The Sims 4. But they didn’t. Now, well into 2015 and almost a year after the original no-toddlers announcement, The Sims Studio still hasn’t done anything to The Sims 4 to address fans’ concerns about toddlers. Nor have they revealed plans to do so. Most infuriating for family play fans, however, is that the developers haven’t offered any explanation for why they haven’t prioritized adding toddlers into the game. What makes the developer’s behavior here seem peculiar is that they continue to go out of their way to communicate with fans—even these most upset ones. Elaine’s popular thread—and many others like it—remain active to this day. I’ve corresponded with more than a dozen other family play fans who participate in her discussion and other, smaller threads. Almost all of these players have stopped playing The Sims 4 regularly. Many are refusing to pick the game up again until they’re convinced it’s been satisfactorily improved. They bring up two main issues they have in common. First, they’re upset about what they see as The Sims Studio’s continued neglect of their preferred gameplay style for The Sims 4: one that prioritizes simulation of domestic family relationships and activities, and therefore requires toddlers to be present. 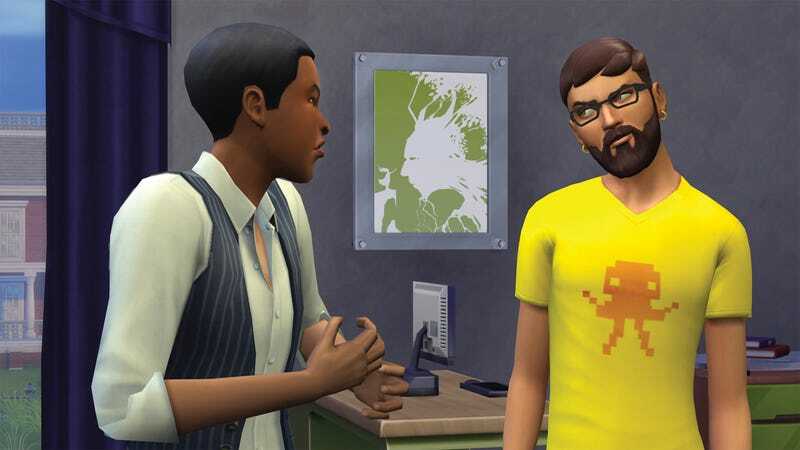 Second, they identify a frustrating dynamic that’s taken shape between them and the SimGurus—members of the development team who regularly communicate with forum-going players and solicit feedback from them. Being some of the most vocal and active members of the official Sims forums, the indignant family play fans encounter Gurus more often than most (if not all) other Sims players. A little corporate-speak, sure, but nothing too out of the ordinary as far as these kind of public interactions go. What angers family play fans like Elaine is the nonresponse they see whenever a Guru assures them that they are being heard. Because, so far, nothing has happened. That’s in spite of the fact that the developer has continued to release other types of content for the game: the “Outdoor Retreat” game pack, the “Get To Work” expansion, and—most recently—a luxury-themed stuff pack. And what does The Sims Studio make of all this? As mentioned, there’s nothing more painful than not meeting your players’ expectations. Some players have up to five years of content and experiences in The Sims 3, and we had simply underestimated their passion and loyalty for that game including features such as toddlers. Asking fans to essentially break up with The Sims 3 and start a new relationship without more information was a little naïve. With The Sims 4, we made the decision to focus on fundamental changes to the Sim behaviors such as multitasking, emotions, traits and interactions, and we focused first on the later life states. Toddlers are not simply small Sims, they are a completely separate Sim type, deserving of the same level of investment. We want to do it well. It is something we’re exploring but we don’t currently have more information to share around when or how other than to say our fans will be the first to know. It’s the same basic answer the developer gave before the game had even come out yet—when the no-toddler furor first kicked off. The fact is, we owe you a clearer explanation for why pools and toddlers will not be inThe Sims 4 at launch, so here goes. It begins with new technology and systems that we built for this new base game for The Sims – a new AI system, new animation system, new audio positioning tools, new locomotion logic, new routing intelligence and much more are all entirely new in this game. The vision for The Sims 4 is a new experience that brings your Sims to life in deeper and uniquely personal ways – through emotions, personality traits, behaviors and interactions. To do that, our technology base needed a major upgrade. So, rather than include toddlers, we chose to go deeper on the features that make Sims come alive: meaningful and often amusing emotions; more believable motion and interactions; more tools in Create A Sim, and more realistic (and sometimes weird!) Sim behavior. Instead of pools, we chose to develop key new features in Build Mode: direct manipulation, building a house room-by-room and being able to exchange your custom rooms easily, to make the immediate environment even more relatable and interactive for your Sim. All the players want now, Elaine explained in an email, is some word from The Sims 4 developer that they have something in the works for improving family play. But besides the occasional, “We’re still listening!” message, they haven’t received anything like that. I haven’t either. In one recent email to Elaine, I finally asked her something that’s always puzzled me: why not play something else—say, The Sims 3—until you feel they’ve brought The Sims 4 up to your personal standards? “I hope you can see that I really don’t know what to do here,” Elaine wrote in her response. The reason Sims fans take the game’s perceived failings so seriously, I came to appreciate from her response, is because there’s no other game like The Sims out there. It’s not a simple matter of jumping ship to a close competitor for a few months. There’s only one Sims.